In the RS-15XX series of R2R decks, as well as in the RS-9900 and the RS-M95 cassette decks (and possibly in some other equipment) from Technics the line amplification stage is built around a simple n-p-n/p-n-p 2 transistors stage. In its original form this line stage is the main source of distortion in the signal electronics of these decks. A very simple modification, applicable to all aforementioned units, improves the linearity of that stage, reducing both harmonic and intermodulation distortion by over 30dB (!). The sound quality as a result is also much improved. This modification doesn't need any components, only a bit of soldering. The load resistor of the n-p-n transistor (usually 15kOhm in these circuits) needs to be connected not between the base of the p-n-p transistor and positive supply rail, but between the base and the emitter of that transistor. That is all, no other changes required. Below the mod is shown in red on the RS-M95 schematics fragment. Usual warning - if you open the top cover do it with the mains disconnected and take care not to damage anything, including your valuable self! Nakamichi CR-3 and CR-4 Ground connection mod. Both the CR-3 and the CR-4 from my experience do sound considerably inferior to other 3-head Nakamichi decks. Usually the Sony Dolby chips got the blame, however the same chips are working fine in many other decks. Just recently I've restored to full health the CR-3 from my collection and the sound of that deck was, well, again underwhelming, similar to what I've experienced before with the CR-4. This time, however, I've recognised that I've heard that kind of sound deficiency in other equipment and it is usually caused by an incorrect earth arrangement. I just couldn't believe that Nakamichi could do that kind of mistake (or was it a deliberate mistake?!). 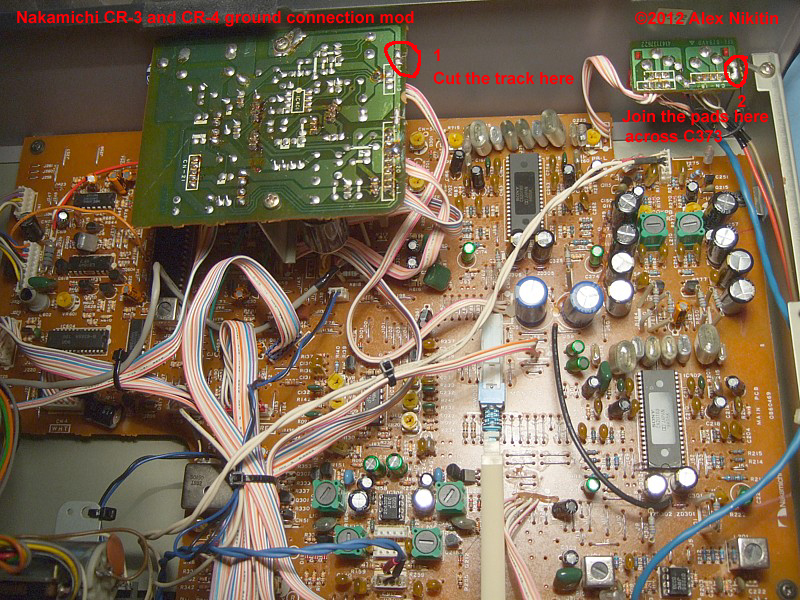 Both the CR-3 and CR-4 share the same power supply layout and the same connection of the electrical "ground" to the metal case - by a screw holding the power supply pcb to the case. On the majority of the other Nakamichi decks the "ground" is connected to the case near the input sockets (there are some exceptions like the 1000ZXL with it's massive distributed ground but that is just a completely different approach requiring a massive metal frame and good with multiple circuit boards). I've made a simple experiment - I've cut the ground plane connection pcb track between power supply ground and the screw pad and installed a couple of 2-pin jumper connectors - one in that track cut and the second - on the input/output sockets "jack pcb" across C373, connecting the case to the "ground" at the input connector. When I listened to the deck the sound difference between the original case connection and the modified one was immediate and the sound with the mod was much better. As the mod is so simple, so effective and easily reversible I thought I would explain it here. The picture shows exact points you need to do the changes to: 1) cut the track on the power supply pcb where shown and 2) join the C373 pins together with a bit of wire. That's all. Information in this section is only for qualified technicians and engineers!